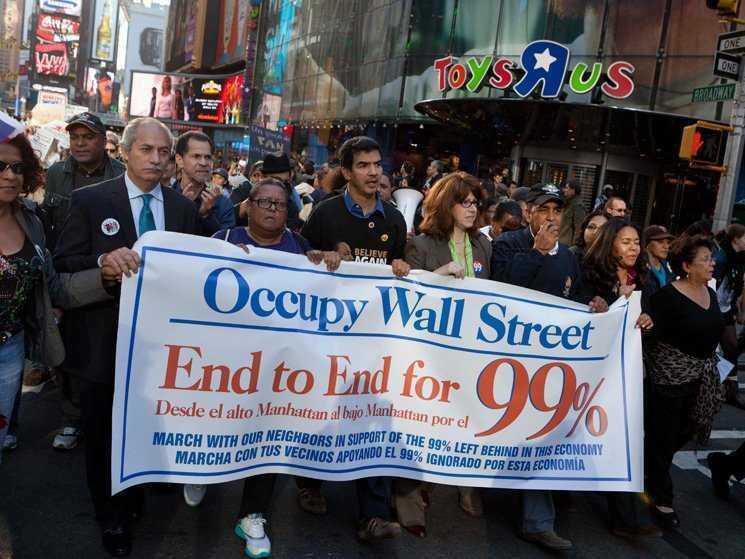 Income and wealth inequality continue to be a major political issue in the US and around the world. The World Economic Forum just surveyed its list of Global Agenda Council Members on the biggest issues facing the world, and rising inequality came in at number one. 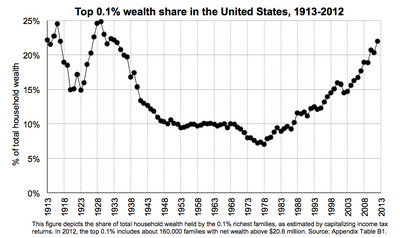 On a number of measures, inequality in the US has been rising for the last few decades. 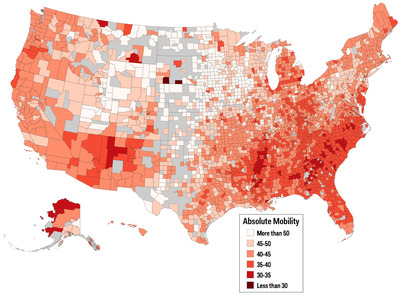 We put together a dozen charts and maps that show some of the core issues of inequality. The Gini index is a standard measure of inequality, ranging from 0 to 1. The index measures how far away the income distribution in a population is from a completely egalitarian distribution. An index of 0 corresponds to a completely equal distribution, in which everyone has the same income, and and index of 1 is a completely unequal distribution, in which one person gets all the income and everyone else gets nothing. 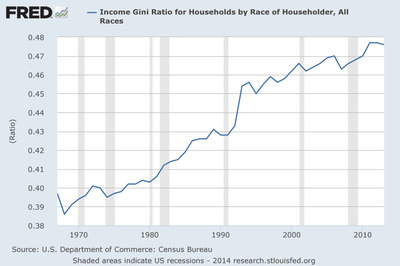 The Gini index has steadily risen in the US since the late 1960s. Gini indexes in metropolitan areas and areas around middle-sized towns range from a fairly egalitarian 0.36 in Juneau, AK to a highly unequal 0.55 in Ruston, LA. 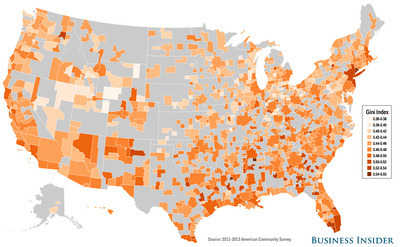 We recently made a list of the most unequal large metro areas based on US Census data. 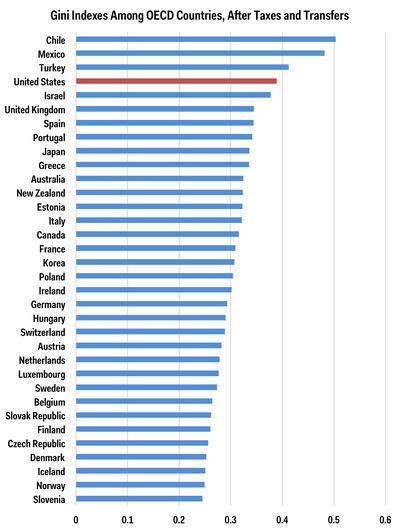 Among OECD countries, only Chile, Mexico, and Turkey have more inequality by this measure. 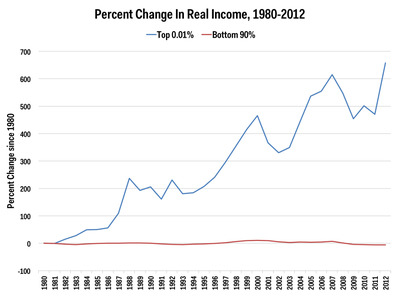 Another way to look at inequality is to consider how much of the national income goes to the top of the distribution. 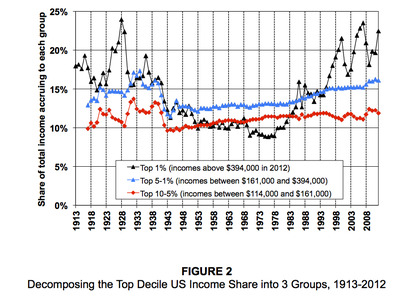 Here's the share of income for the top 10% in the US over the last century or so. 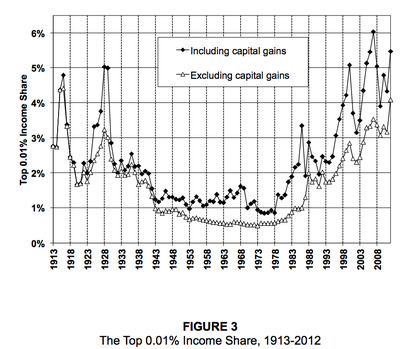 According to a 2013 paper by Berkeley economist Emmanuel Saez, at the start of the century through the roaring twenties, the top of the heap got an outsized share of income. After the New Deal and World War II, that share drops precipitously, in a period often referred to as the 'Great Compression'. 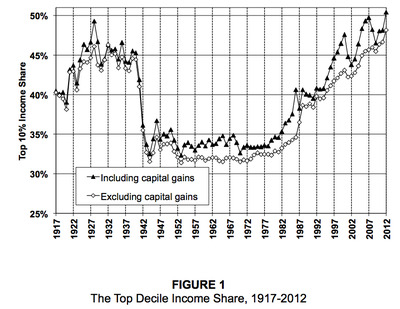 From the early eighties to the present, that top income share has started to skyrocket back to where it was at the start of the twentieth century. The top 1% is responsible for most of the top decile's gains, while the rest of the top 10% saw much more modest increases. 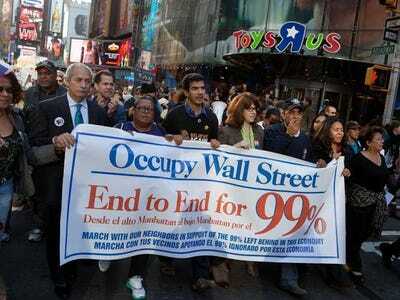 The top ten-thousandth of earners -- the top 1% of the 1% -- took in about 5.4% of total income in 2012. 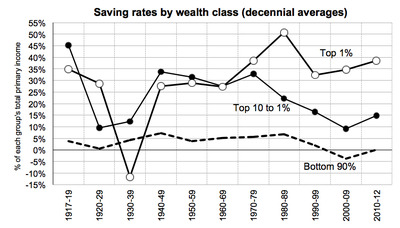 The wealth share of the top 0.1% has more than doubled since the 1980s, according to a recent study based on estimating wealth from income tax returns done by Emmanuel Saez and Gabriel Zucman. 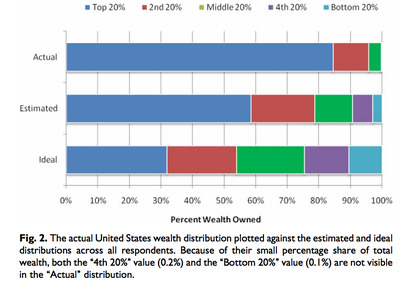 A 2010 survey showed that both Americans' ideal and estimated wealth distributions were far more equitable than the actual wealth distribution. 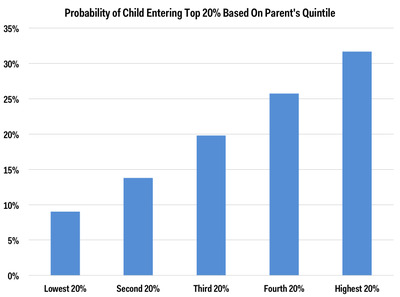 This chart, based on data from the Equality of Opportunity Project, shows that the higher up on the income ladder a parent is, the more likely their child will end up in the top part of the income distribution. A child whose parents are already in the top fifth is more than three times as likely to stay at the top than a child from the bottom fifth is to get there. 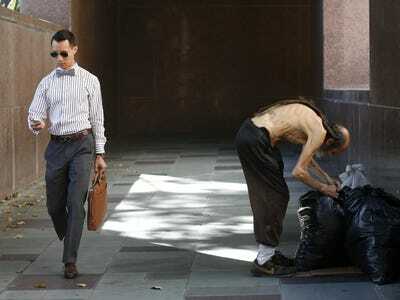 A man looks at his phone as he walks out of the courthouse past a man arranging his bags in Los Angeles, California July 8, 2014.